Claude takes care of the important work of hanging his costumes out to dry, with his trusty sidekick, Sir Bobblysock, supervising from his lounge chair. After the work is over, Claude pulls out his new trampoline and the shenanigans begin. With each bounce he gets a view of the action on Waggy Avenue where he sees a gorilla sporting a cup of tea and his curiosity gets the best of him. Why would a gorilla be drinking a cup of tea? With Sir Bobblysock bouncing along beside him, Claude shoves the trampoline in his trusty beret and heads toward the action on Waggy Avenue. Tripping over the clothesline doesn't slow Claude down. He shoves it with all of the costumes inside of his beret too. His excitement builds when he finds Waggy Avenue lined with cameras, spotlights, and microphones. 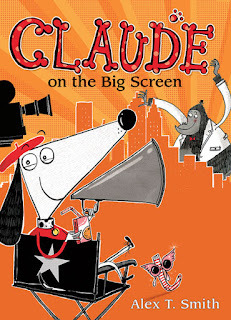 An invitation to watch the filming a movie lands Claude a front row seat. Unfortunately, his inability to sit still shuts out the lead actor and actress. Will Claude and Sir Bobblysocks have what it takes to save the movie? As always, Claude's zaniness leads to chuckles which turn to laughter with the continued absurdity of his antics. The ever endearing Claude, with his snazzy sweater and classy beret, help the young reader navigate from the picture book into the next reading level through bizarre and lighthearted fun. 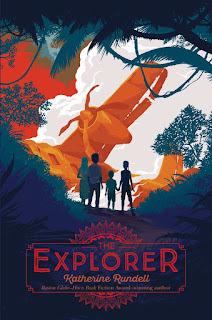 When their plane crashes in the Amazon rain forest on their way back to England, Fred, Con, Lila and Lila's brother, 5 year-old Max fight to survive. Finding shelter and edible fruits poses proves challenging for the inexperienced children. Through their resourcefulness, the children find things like mixing ground up grubs and cocoa give them a paste and the protein they need for survival. Max stumbles onto a map and convinces the other children to follow it to the X. The course of their adventure presents new dangers from predators and the elements. They manage to build a makeshift raft and travel down the river where they discover the remnants of an ancient city. To their surprise, a mysterious lives amongst the ruins. He refuses to give the children his name but Max assumes he is the missing explorer from 1925. Does the explorer hold the key to the children's chance at rescue? Rundell captures the beauty of the Amazon through vivd description of everything from the lush vegetation to the smells of the rainforest. Both the setting and adventure will captivate the reader and perhaps motivate further exploration. It may also inspire the reader to gain further understanding of the effects of imperialism in the Amazon. Despite the lack of depth in the characters, the suspense will hold interest to the end. Gus can't wait for the basketball season to get underway. Being from the Dominican Republic, those around him expect him to be a baseball guy but his skills on the basketball court back up his confidence. With his friends Jack and Teddy trying out for the team, Gus looks forward to an awesome season. Tryouts don't go as planned when his friend Cassie shows up to try out for the boys team. Cassie excels in many sports the 8th grade boys basketball team proves no exception. 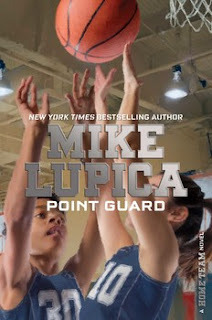 As Gus grapples with mixed feelings of having to answer to a girl and trying to maintain his friendship with Cassie, he is forced to question his place on the team. Those who love sports will have no problem relating to the dynamics between the players. Even though the story touches on some side social themes, it does lack depth at times. Otherwise, a solid story.